Any trip to New York has to include a tour of downtown Manhattan, and what could be better way to do it than a good run through the main sights. You'll find lots of beautiful, park-lined waterfront, Ground-Zero at the World Trade Center, and the city's most historic buildings. Downtown NYC is the site of the original Dutch settlement at the mouth of the Hudson. 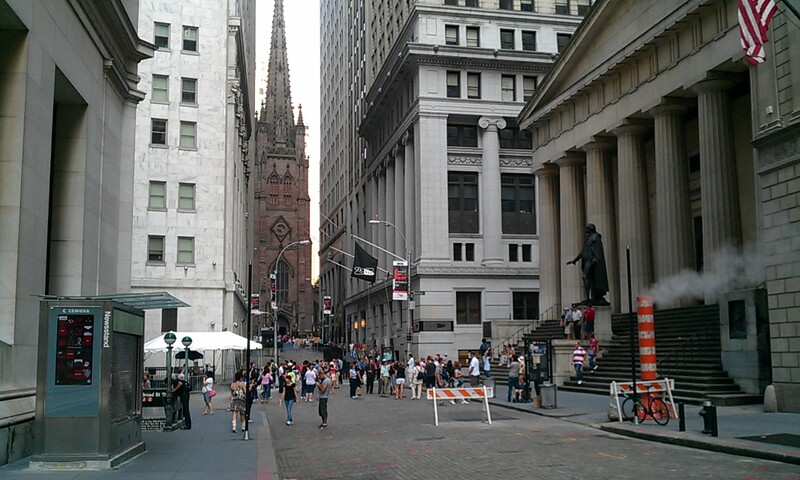 Wall Street really did have a wooden wall back then, to protect the town from attacks from the north. So if you are ready to tackle this interesting New York neighborhood with your running shoes, let's go! We'll start out at the Ground-Zero World Trade Center site. This site is still being built upon, so it will continue to change in the next years. The centrally-placed memorial with the fountains plunging into the foundations of the old WTC buildings just opened, as of my last visit. The route begins at the corner of Liberty Street and Greenwich. 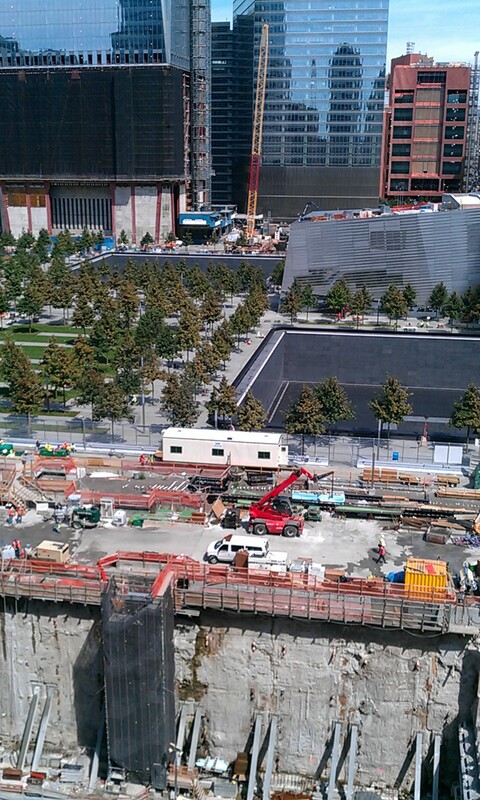 This borders on the construction site of new buildings going up along the east side of Ground Zero, where you can view across the site to the memorial on the other side. This is also the location of the impromptu memorial to the NYC firemen who lost their lives at the 9/11 attack, set up on the side of the fire station closest to the site. 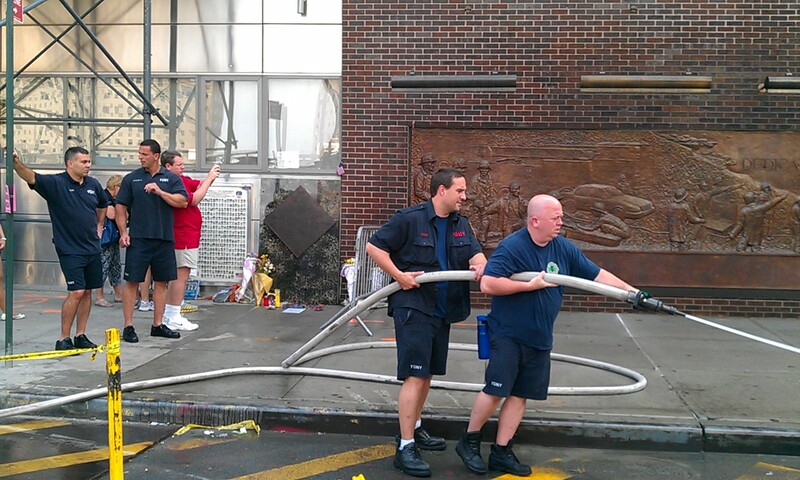 There are normally flowers placed on the sidewalk and patches from visiting firemen and policemen from around the world. Now run south along Greenwich, along the Ground Zero site until the next corner at Albany Street, where you turn right (westwards) and run along the construction fence. Keep running west, crossing busy West Street. On the other side of the street, there is a big new development of nice apartment buildings on tree-lined streets. Run straight to the water of the Hudson River. 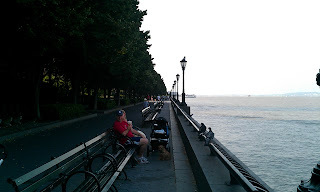 The waterfront Esplanade is also tree-lined: a pleasant stretch with views out to the Statue of Liberty, Ellis Island and the gleaming new buildings of Jersey City across the way. NOTE: You could also run northwards here for awhile, going past North Cove Marina and Penny Park, if you want to add some more distance to this route. Now run southwards towards Battery Park, at the southern tip of Manhattan. You'll run along a cove, with the Statue of Liberty off in the distance. You'll also pass the pyramid-shaped Holocaust Museum. The path ends for a short time at historic Pier A, being restored at the moment, with it's old-fashioned bell tower. 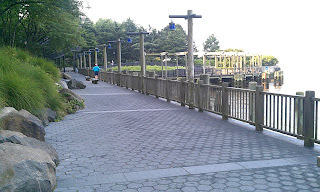 Just run past the pier, along the left side, and then turn right, into the first path into Battery Park. You will see the stone fortress of Castle Clinton ahead. 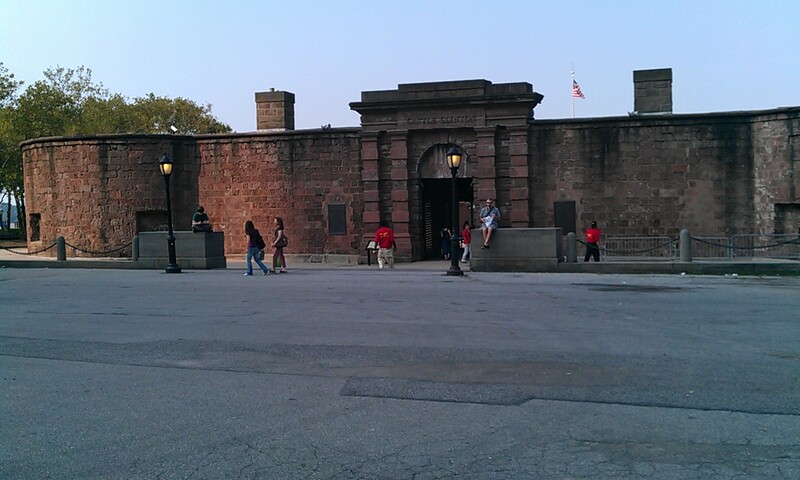 This fort, also known as Castle Garden, was used to process new immigrants until Ellis Island was built in the 1890s. 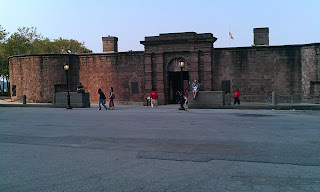 It's now used as the landing for the Liberty Island ferry. Keep running past the fort along the water. This takes you by the World War II Navy Memorial till Battery Park ends at the Staten Island Ferry building. Run northwards along South Street for another block. 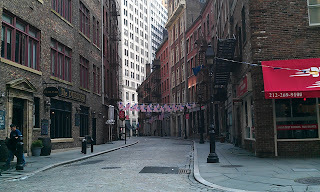 Now cross the street to the left at Broad Street and run to the first corner, at the Fraunces Tavern. George Washington held a farewell party for his officers in this historic tavern. Turn right on Pearl Street and run 2 blocks to Hannover Square. The English-style garden in the square was donated by the British to the American people. Now turn left and run the 2 blocks along William Street to Wall Street, as the street curves to the right. 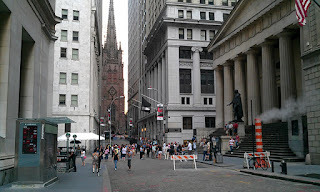 At Wall Street, turn left and run past Federal Hall on your right (site of George Washington's inauguration) and the New York Stock Exchange on your left. Wall Street actually was a wooden wall at one time, and marked the north edge of town. Wall Street ends at Trinity Church, one of New York's most interesting buildings, with its old graveyard. Just running by the graveyard, I saw the graves of Alexander Hamilton and Samuel Fulton (Fulton built the first steam ships and the first submarine). At this point, we are almost back at the starting point, but let's do a short extra loop to add a few interesting downtown sights. Turn right on Broadway, in front of Trinity Church. In a couple of blocks you will pass St. Paul's chapel on the left side. This chapel was built for the people who lived north of the wall. George Washington went here to pray, it is said. The church also became the main sanctuary for Ground Zero rescue workers, and has become an impromptu memorial to the victims. In one more block, you will see a triangular park, City Hall Park, opening up on the right side. Run into the park, which is the commons in front of the old town hall, built in 1810. And on the left side of the park you can see the gothic Woolworth's skyscraper looming up, the tallest building in the world when it was built in 1913. 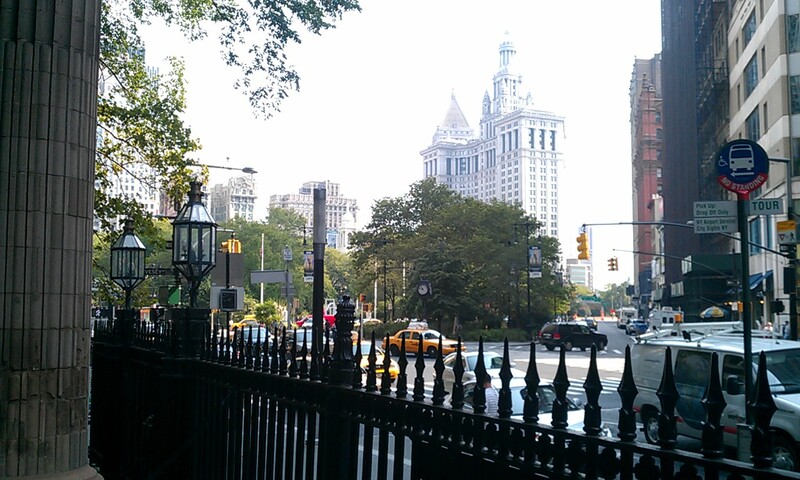 When you get to the city hall, turn left and exit the park, which is bounded by Broadway on the left side. Now, turn left and run back southwest down Broadway, past St. Paul's again, until you get to Liberty Street, where you turn right and run the last 2 blocks back along Zuccotti Park (location of the Occupy Wall Street encampment) until you reach the starting point again.